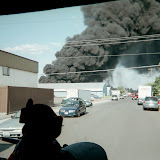 NARRATIVE: On May 18th at 12:55 the City of Spokane Fire Department responded to a reported structure fire at 37th and Mt. Vernon. The first arriving company reported a one story frame wood structure at 3606 Mt.Vernon with fire showing from the back side. The fire crews advanced attack leads into the structure and completed a search, no one was found inside. Fire spread from the back of the home into the first and second floors and into the attic. Roof crews ventilated the roof to release heat and smoke. The fire was extinguished in about 30 minutes and overhaul took 2 hours to complete. It was reported that this was a duplex and that was incorrect, this was a large house with a small apartment attached. One firefighter was released from duty and sent to a local hospital to be checked out. He was hit from falling debris. The house suffered extensive damage to interior attic and roof. Twenty firefighters and two command personnel responded to this fire. The fire is under investigation.